Ruffin Canyon offers primitive trails. Access is on the west and east sides of Taft Middle School 9191 Gramercy Drive. This unique habitat needs our care. You are invited to join the Friends of Ruffin Canyon. 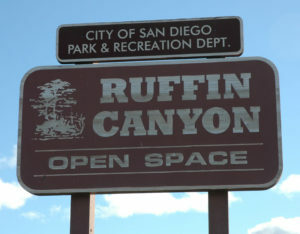 Our goal is to foster community participation in the protection of Ruffin Canyon. First Saturday of every Month We meet at the west side of Taft near the parking lot at the Native Habitat Garden for Restoration Work. Come anytime between 8 AM and Noon. All are Welcome to Come and Help! Fourth Wednesday of the Month We usually meet at the Serra Mesa-Kearny Mesa Library at 5:30pm. For more information, you can download & view our brochure or visit our Yahoo Group.